The hip joint is one of the largest weight-bearing joints in the body, formed by the thighbone or femur and the acetabulum of the pelvis. It is a ball and socket joint with the head of the femur as the ball and the pelvic acetabulum forming the socket. The joint surface is covered by smooth articular cartilage which acts as a cushion and enables smooth movements of the joint. What is a Chondral Lesion or Injury? 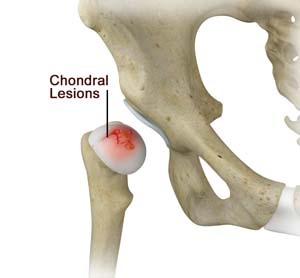 A chondral injury refers to an injury of the articular cartilage that covers the joint. Diagnosis of chondral injuries involves a thorough medical history and physical examination by your doctor. X-rays and MRI scans are also useful in diagnosing these types of injuries. However, arthroscopy is the most accurate way of diagnosing, evaluating, and managing chondral injuries. The management of chondral injuries depends on the severity of the injury and includes non-surgical and surgical modalities of treatment. Non-surgical treatment includes bracing, oral and topical anti-inflammatory medications, corticosteroid and hyaluronic acid injections, physical therapy, and modifying or avoiding specific activities. Hip arthroscopy, also referred to as keyhole surgery or minimally invasive surgery, is a surgical procedure employing an arthroscope, a narrow tube with a tiny camera attached on the end, to assess the damage to the hip. Your surgeon makes 2 to 3 small incisions around the hip joint. The arthroscope is inserted through one of the incisions and the camera attached to the arthroscope helps visualize the joint on a monitor. A sterile solution is pumped into the joint to clear the view and increase the space for surgery. Specially designed instruments are inserted through the other incisions. During the surgery, any loose fragments, small pieces of bone and cartilage floating within the joint are removed. After the completion of the procedure, the arthroscope is removed and incisions are closed. Autologous cartilage implantation (ACI): In this procedure the cartilage, harvested from the patient or donor, is cultured and later implanted over the damaged area of the joint.